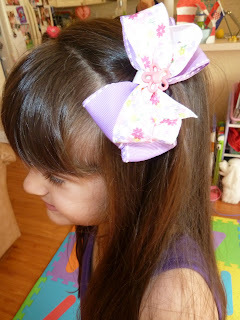 Personally, I have a fondness for handmade hairbows and hair accessories in general. I find the quality and craftsmanship are far superior to mass produced hair accessories. That being said, not all handmade hair accessories are created equally. I have had my share of disappointments. Placing an order & waiting enthusistically for the arrival of our matching bows only to have them fall apart the first time I put them in the Lil Diva's hair. This is why I feel like I have to proclaim it from the rooftops when I find someone who takes pride in their work and produces a quality product at an affordable price! Woohoo - who doesn't love and appreciate that combination? 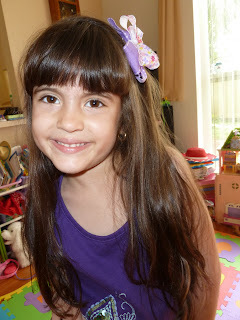 I'd like to take this opportunity to introduce you to Amber of Baby Love Boutique. Amber does amazing work. She was kind enough to send the Lil Divas some gorgeous Springtime bows in their fave colors (pink & purple). They were a hit straight out of the box! 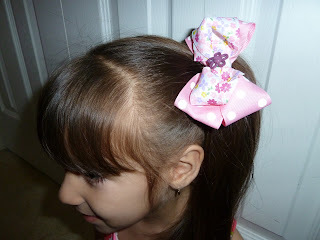 The Littlest Diva literally ripped off the bow she was wearing in her hair to put on her new pink floral hairbow. Even the oldest Diva, who is getting pickier these days, loved her bow and has worn it many times since it arrived. What I love is that the bows have held up wonderfully and still look new after both repeated uses and being handled by little hands. They have lined alligator clips - so no hair pulls or tangles and the ribbons are sealed to prevent fraying. These are beautiful, quality bows at affordable prices. 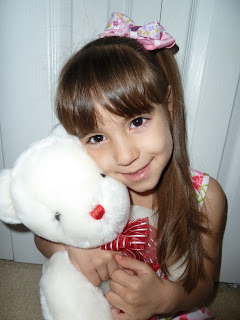 I invite you to visit Amber's Baby Love Boutique Blog and Baby Love Boutique Facebook pages. Baby Love Boutique offers an array of bows, headbands, clippies and tutus. If you are looking for Spring, Easter or even everyday hair accessories - give baby Love Boutique a try - they will not disappoint! I am so excited that Amber of Baby Love Boutique has been gracious enough to offer my amazing followers a wonderful giveaway opportunity. Visit Baby Love Boutique and tell me which Bow or Itty Bitty Clippie you would like to win! Disclaimer:I received 2 hair bows for the pruposes of trying them out for this review. That being said, this review is my 100% honest opinion of this product - I am not paid for my reviews or optinions! They are 100% mine! Please remember that your opinions and tastes might differ from mine. I like the pony tail holder with the different color ribbons. I love the ittie bittie clippie set! I would like to win the Super Star bow. It looks really cute!! I like Baby love boutique on FB and I told her you sent me! I commented on your Wordless Wednesday bowling post!